Easter is a few weeks away! Today I’m joined by 21 other amazing bloggers for the Easter Extravaganza! 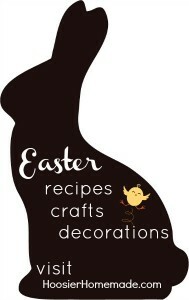 The Easter baking and craft projects are simple adorable, so be sure to check them all out! What’s better to share than Easter Cupcakes, but these aren’t just your ordinary, run of the mill, decorated Easter Cupcakes…they have a surprise in the middle! You may remember the heart that I baked in the center of the Valentine’s Cupcakes, well these Easter Cupcakes have an Egg baked in the center. Look for the full recipe below, but first…join us for the Easter Extravaganza!! This is such a cute idea that I have been wanting to try for a while. I am bad commenting, but I want you to know that I read your newsletters every night and I love all your creative ideas. You are such a great mom!! I need to jump on the “suprise inside” bandwagon pronto! Your cupcakes are so pretty! Love those hidden eggs! Love these! What a cute idea 🙂 The colors are great. Love the surprise inside and they are so pretty looking too. Thanks for sharing this great idea, Liz! How cute – the purple is my fav and the added surprise inisde is SUPER CUTE! So colorful and l love the hidden surprise!! Love the Egg Surprise inside! These look so much fun and colorful! 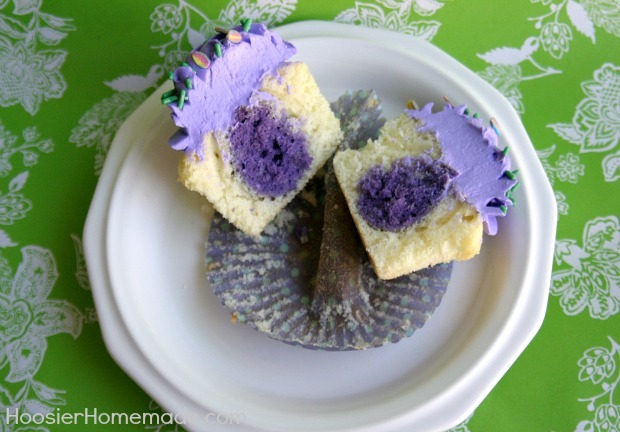 I love cupcakes with hidden surprises inside — I really need to try it one of these days! Your cupcakes are so pretty. 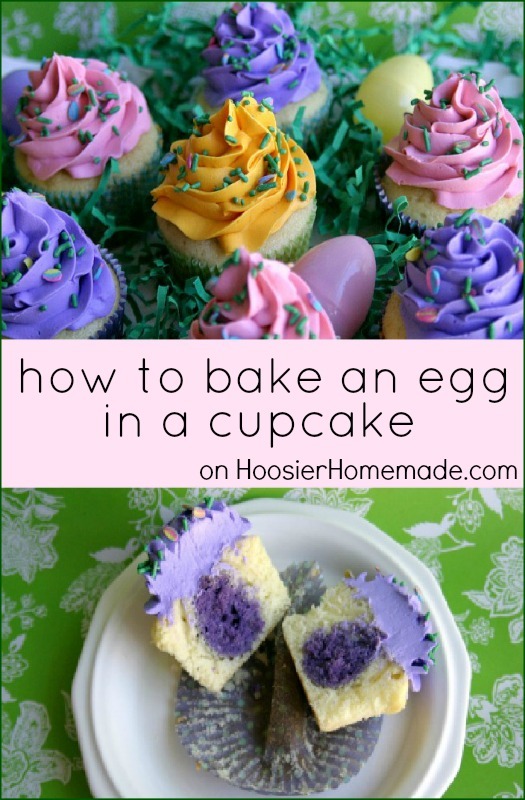 I especially love the purple colored frosting and egg. What a cute idea, I like your version more than the usual frosting injection. These would be great for the gender reveal parties. Thanks for sharing. Had to give a quick “woah, good idea” for the gender reveal party thing.